First, It’s important to note that it isn’t permanent “removal” of the hair, rather it is permanent “reduction” of the hair. Considering the alternatives; lifetime commitments to shaving and waxing, painful procedures, and plucking, we at The Naked Truth believe the satisfaction of 90% – 95% permanent reduction to be nothing short of permanently rewarding. The Naked Truth would love to bore you with the many sciences behind the process of laser hair reduction but being wholly user-friendly and transparent for all of its clientele, The Naked Truth has decided on a different approach… Simplicity. Keeping it simple, the laser beam primarily attacks the blood supply at the bulb of the hair root. So long as it is actively growing the results are spot on. Cutting off the blood supply and permanently damaging the follicle it will then purge the hair. This process of where the hair purges can take a couple of weeks or in some cases it can happen right away. Here at The Naked Truth Port Coquitlam, we like to take our clients back to the bare basics, by removing unwanted hair you can one day leave the studio feeling baby smooth. The Naked Truth in Port Coquitlam took another leap into the Venus Family and has brought aboard the newest diode on the market. It’s a powerful and efficient system that’s more versatile and easier to use than other devices. Treatments are faster, getting you home quicker, or making it easier to schedule your appointments on lunch breaks or in between all of life’s other demands. The old saying “no pain no gain,” is almost a thing of the past with this new laser, as it is one of the most comfortable on the market. 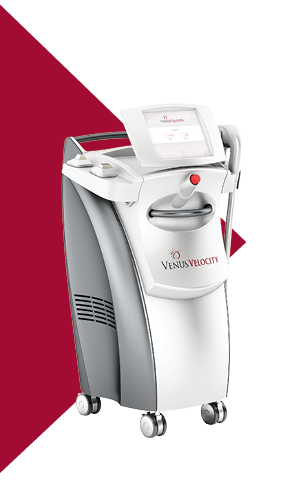 Perhaps one of it’s finest features is that with this laser you will no longer have to hear the words “no tanning between appointments or no tanning 4 to 6 weeks prior to treatment,” because this laser works on all skin types, EVEN TANNED. No need to put any summertime fun on hold or to reschedule those boating trips, just let the Venus velocity get you hair free and silky smooth no matter the time of year. Please note, any area not listed here is priced at the technicians’ discretion. Add-ons like toes and feet range in price from as little as $50 and up. Touch ups are by session and priced at the technician’s discretion. No, it is not permanent hair removal it is permanent hair reduction. The laser can only remove hair that has pigment in it, so fine blonde hair cannot be removed. To determine whether or not you are a candidate your skin and hair needs to be classified on the Fitzpatrick scale. Laser hair removal works best on individuals with pale skin and dark coarse hair however here at The Naked Truth we have technology that is successful for permanent hair reduction in all skin types, so if you aren’t sure stop in for a free consultation and a spot test at our Langley Laser Hair Removal studio. The amount of treatments necessary varies from area and skin type but a fair average is between 6 and 8. Roughly only 15 % of hair is in its growth phase at any given time and in order for the laser to work it needs to attack the hair at the root when in this phase. To achieve the best results, it is important to stick closely to the treatment time-line the specialist provides you and maintain good pre-and post-treatment care. To a degree yes, laser hair removal isn’t pain free. We do have several methods in place to help manage the pain and the machines we use are some of the best in the industry for lower pain levels. Once you’ve had a few treatments and hair growth has been reduced pain levels also diminish. We promise to make it as close to pain-free as possible. Side effects are uncommon but may include, hyper or hypo-pigmentation, mild to moderate burning, permanent skin discoloration, temporary redness and or swelling. Itching in the treated area, hives or rashes are typically an allergic reaction. This doesn’t mean you have to stop having treatments, it will clear up in a day or so and if it doesn’t clear up right away usually an antihistamine is all that is needed. The best way to minimize the risk of any of the aforementioned side effects is to avoid sun exposure of any kind at least a week before treatment. Avoid tanning for at least two weeks prior. Avoid sunless tanning products at least a week before as well. Laser can’t be done on top of tattoos. If you are looking for tattoo removal stay tuned into The Naked Truth in Langley for the introduction of this service in 2018. Our pregnant clientele will have to wait till their bundles of joy are out and about to get laser. In the meantime, stop by anyhow and maybe grab a lash nap, mommies to-be need their rest. Unfortunately, in order to be a good candidate for laser hair removal, there are some things to do, and some things to avoid prior to treatment. Avoid tanning for 2 to 4 weeks prior if possible. However, if you are tanning still please notify us when you book as we do have lasers that work on tanned skin. Avoid anti-inflammatory medications and antibiotics if possible 5 days prior to treatment. If you are on a regular medication prescribed by a doctor be sure to consult the doctor and/or the laser specialist to see if the medication will be a problem for laser treatment. If getting treatment in the underarms avoid deodorant for 24 hours prior to treatment. Make sure to cleanly shave the area the day before treatment. Be sure to keep your medical history up to date with your specialist/technician. Without knowing the truth, you put yourself in jeopardy and open yourself to the risk of burns. Remember here at The Naked Truth in Langley we bring you back to the bare basics by keeping it honest. What should I do Post treatment? Post-treatment care is necessary to achieve the desired results otherwise you risk poor results and an unhappy disposition after having spent money. We want to make sure you are happy with the results so the best we can do is provide quality machines and proper care instructions. Be sure to avoid the sun between sessions if possible and if you must be in the sun use an SPF 30 or higher, we prefer you to use higher. Of course if you’ve been treated with the Diode it is okay to be in the sun although for best skin protection we still suggest using at least an SPF 30. Avoid any other laser treatments on the area for at least 2 weeks. Do not wax or tweeze or do electrolysis between sessions, shaving if necessary is okay as it does not disturb the hair root. Make sure to book your next treatment at the Naked Truth in Langley and to follow the schedule as best as possible and you will be baby-smooth in less time. Exfoliate treated areas to avoid the possibility of in-grown hairs. Just got my chest done for the first time ever..yes I’m going back..gonna be way easier than shaving it all the time!! Love the staff, love the environment and the most important thing ..love the prices !! The wife is going in next week!! Had a really great experience here, Elissa made me feel super comfortable about the process! She was super knowledgeable and told me everything I needed to know. I would highly recommend coming here for services! Can’t wait for my next treatment!